Not usually one of our more favorite destinations, but SoCal came a calling for an HC Pro Bootcamp for Jill to teach, so off we went! We both left out of Binghamton on Sunday, Jill in the morning on United through Dulles, and I went in the afternoon on Delta via Detroit. For this camp, we were actually in Arcadia, California, at the Hilton Garden Inn. It's really gotten to the point with hotels for us that you've seen one, you've seen them all. A few standout, in both directions, but overall you could pick any up and plunk them down in any part of the country and they'd fit right in. Jill picked me up from LAX on Sunday night, and drove us back to the hotel in Arcadia. It was after 10:00 by the time we got back to the hotel, so Sunday was a wash at that point, EXCEPT! When we got to the room, Jill gave me my birthday cake! It was a delicious cake from the J.J. Bakery in Arcadia. It was a vanilla cake, with strawberries in the middle, and strawberries and kiwi on the top, with a vanilla frosting - my favorite!! On Monday, class started for Jill, and it gave me my first opportunity to do some 'sightseeing'. Being that this was only the second time we'd ever been in L.A. (as a destination), there was quite a bit to see. I actually drove out to Ontario, California to check out the rink there and grab up some tickets for the game on Friday. This is a brand new facility, and in some ways (from the outside), it was very reminiscent of the rink in Seattle. I also searched out "The Epicenter", home of the California League's Rancho Cucamongo Quakes, and snapped some pics there as well before heading back to Arcadia. I spent the afternoon in class with Jill, and that night we went to dinner at BJ's Brewhouse, right down the street from the hotel. Decent food, generic chain restaurant/bar atmosphere, fit the bill for us that night. Tuesday brought with it some touring around of some LA landmarks. I started off the day in Pasadena, finding the Rose Bowl, as well as the house used in 'Father of the Bride', as well as a couple of houses used in 'Back to the Future' and 'Star Trek Generations'. From there I drove down to Dodger Stadium! I did an hour and a half tour of that great facility, and saw all of the usual. By the time the tour was done, it was only 11:30 - more time to kill, and I had found the perfect place to trek to! 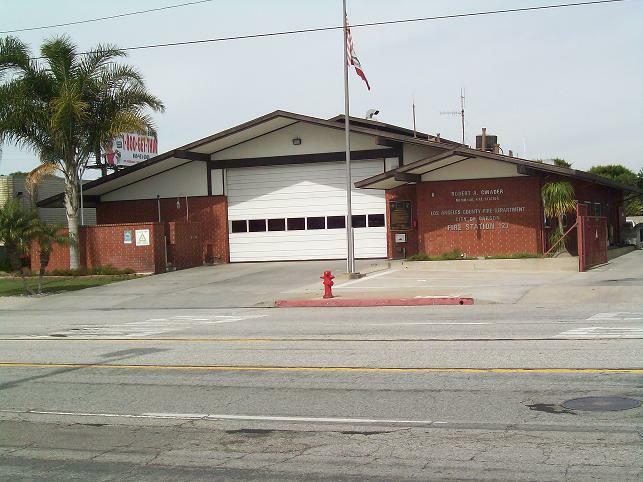 LA County Fire Department Station 127! Better known as Station 51 from the Emergency! series! Very cool to see that and snap a couple of pics! 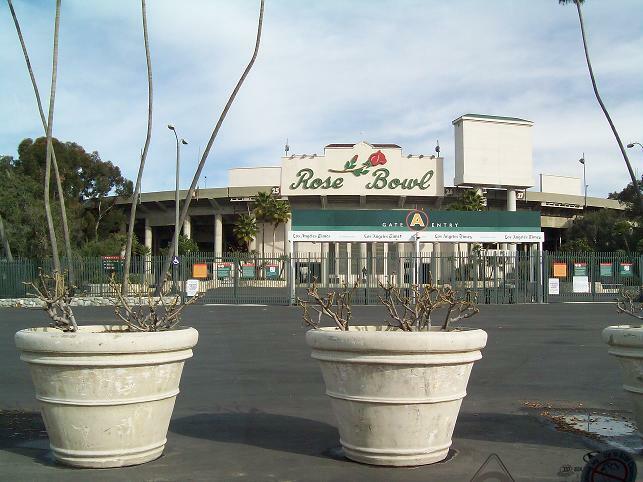 I then found the Home Depot Center, LA's soccer stadium, but I couldn't get into the stadium so there aren't any pics. From there, I had enough of the driving around, so I went back to the hotel. At night, Jill and I went out to dinner at La Adelita Mexican Restaurant on East Colorado Boulevard in Monrovia and had a very good meal. On Wednesday, I did some more wandering around, finding the building I always remember seeing in the Rose Bowl Parade (and seeing the 'big turn' that they always take), as well as some more fire stations. In the afternoon, I went to Santa Anita Park - an absolutely beautiful horse track right up the road from where we were staying in Arcadia. It put Churchill Downs to shame! Wednesday night though, the highlight of our trip to SoCal! Jill made us dinner reservations at The Dining Room at Langhem, where none other than Michael Voltaggio was the chef! This would be our second 'Top Chef' experience (the first being last December in Atlanta at the Woodfire Grill). Before dinner, we went into 'Old Pasadena', an area that was essentially the old downtown area that had been converted into trendy shops and eateries. Truth be told, it looked very much like Downtown Binghamton, less the blight that is! We parked and walked around, settling into a bar called 'Bar Celona' - LOL! To funny! We watched the end of the Russia versus Canada hockey game, had a couple of sangrias and a yummy flatbread, and then walked on. Stopped at the Urban Outfitters before heading back to the car and onto the Langhem! The decor at the Dining Room didn't exactly match Michael Voltaggio's 'style', and we had read that prior to going, but none the less it was a beautiful space. Dark wood, elegant tables, beautiful hanging chandeliers all added to the 'exclusivity' of the experience. Shortly after being seated, we were given two glasses of champagne, in honor of my birthday which Jill had told them we were celebrating. We were also served a sourdough bread and a bacon roll - very, very good! We then ordered, and along with our meals we ordered the beverage pairing as well. Unfortunately, while enjoying our meals and pairings, I forgot to 'write down' the drinks we were having, so I'm only able to write about the food we had. For the first course, Jill had "Langoustine Young Fennel, Porcini Mushroom Lasagna", and a Jodori Chicken dish; I had "Kurobuta Pork Belly Bok Choy �Kim Chi�, Kabocha Squash Preserves, Peanut Butter Noodles" and "Pastrami Pigeon Swiss Cheese, Sauerkraut, Rye". Yes pigeon!, and YES it was very, very good! As I said at dinner, if I was going to actually eat pigeon anywhere, this would be the place, and I was not disappointed! The second course, or 'middle' as the menu referred to it, Jill had "Mediterranean Sea Bass Mussels Billi-bi, Fennel, Quinoa", and I had two dishes - "Milk-Fed Veal Breast Perigord Truffle, Panisse, Grapefruit, Artichoke" and "Wagyu Short Rib Smoked Potato �Tots�, Nantes Carrots, White Ketchup". Between the middle course and the end course, they served us a 'palate cleanser', which was Dippin' Dots! Vanilla and chocolate dippin dots' - I'm sure they would have a fancy name for it, but that's what they were. Although, they tasted a lot better than the stuff you buy at sporting events! For the 'end' course, Jill had "Fools Gold Chocolate, Salty Hazelnut Praline, Milk Sorbet" and I had "Sticky Toffee Pudding Jasmine �Rice Cream�, Lime, Banana Custard". An awesome end to an awesome overall meal! And all for the bargain price of only $365.00, but that's including the tip! Since this was the second 'Top Chef' finalist restaurant for us to visit, we couldn't help but 'compare' the overall results of the meal. Our impression in the end? The overall meal at Woodfire Grill in Atlanta was better than this. This is not to say, in any way, that the meal here was anything short of excellent, because it was, but the food at Kevin's place was just, well, better. It'll be interesting to see where Brian's restaurant falls when we visit there later this year! So, Thursday rolls around, and at first I was just going to hang out and do 'nothing'. But, why waste a perfectly sunny and warm day in SoCal in the hotel room! So, I loaded into the car (Otter came along too), and we went to Anaheim. It ended up being a lot 'closer' than I had originally thought, and only took about 45 minutes to get there (which is pretty quick in SoCal speak). We stopped at the Honda Center and Angel Stadium to snap some pictures - I REALLY regretted not scheduling my tours better since they only do them here on Tuesdays, and first impressions it looked a lot nicer than Dodger Stadium! From there, I went over to Downtown Disney, which was my original destination anyways. I wanted to find the new, limited edition, Alice in Wonderland 'ears' for Jill, but alas they were all sold out! Dang! From there, I began the trek back towards Arcadia, weaving my way through L.A. and passing the Forum (old, non-descript looking building! ), the LA Coliseum and LA Sports Arena (both of which in desperate need of touch up AND a bigger security presence), before coming back through downtown LA, up the 110 through Pasadena, and back to the hotel. On Friday, Jill finished up class and we headed out of the hotel about 2:00. Our first stop was back to the Santa Anita Racetrack to relax, have a couple of beers, and watch some horses running around. After a couple of races we decided to leave, and stop at the JJ Bakery (where she got that great birthday cake of mine!). Then it was time to make the drive to Ontario for the hockey game. Another rink in an 'odd' place for us to see it. Odd meaning, this isn't a rink we would have gone out of our way to get to, but since we were 'in the area' and it was my birthday and all, we figured what the heck! This was the second season that the 'Citizens Business Bank Arena' was open, and it was similar to the rink in Seattle that we had been to a couple of months back, just bigger. The other difference we noticed, the crowd wasn't as 'refined' hockey wise as other places we had been - the sport was obviously still new to most folks, with most of the cheering occurring when there was a huge hit or the potential of a fight. After the game, we drove back to LAX where Jill checked into the Renaissance Hotel just outside of the airport, and then drove me over so I could check in for my flights. To get home, I kind of be bopped around the country, going from Los Angeles to Memphis, then to Detroit, then finally to Binghamton, arriving home around 4:15 on Saturday afternoon (my journey had started at 1:40 AM in LA). Jill arrived home later Saturday night around 11:00. ONTARIO, Calif. � The Ontario Reign, proud affiliate of the NHL Los Angeles Kings, defeated the Utah Grizzlies, 7-3, on Friday evening at Citizens Business Bank Arena before 6,224 fans. Forward Greg Hogeboom put the Reign on the board first when he wrist shot the puck past goaltender Mitch O�Keefe�s glove side at 7:47 in the opening period. Center Tim Kraus set up the play by passing the puck to his right where Hogeboom was located. Defenseman Michael Egener gave Ontario a 2-0 lead at 5:32 in the 2nd period when he fired the puck past O�Keefe. Tim Kraus picked up his second assist of the night. Utah forward James Sixsmith was the first to score for the Grizzlies at 8:07. On a 5-on-3 man advantage, Sixsmith beat goaltender Curtis Darling stick side. Defenseman Peter Aston assisted on the play and narrowed the Reign�s lead to one goal. At 16:02, Right wing Tony Voce shot the puck over the shoulder of O�Keefe and notched the third goal of the game for the Reign. Forward Michael Pelech and right wing Todd Jackson assisted on the play. With a couple seconds left in the 2nd period, forward Tom May picked up his own rebound and beat Darling. Sixsmith picked up the only assist on the play and his second point of the game. In the third period, Utah tied the game at 3-3 when Aston shot the puck over Darling�s stick and picked up his second point of the night. The Reign answered back at 5:46 when Kraus passed the puck to Hogeboom who tapped the puck into the net. Ontario took the lead and never looked back. Center Robert Pearce notched his fifth goal of the season when he put the puck in the top right corner of the net. Defensemen Chad Starling and David Walker assisted on the play at 14:51. At 16:47, Hogeboom registered his third hat trick of the season when he broke away from two Utah defenders and placed the puck top shelf. Kraus picked up his fourth assist of the game and Egener notched his third point of the game. With less than 3 minutes left in the game, Voce scored his second goal of the night and Pelech picked up his second assist of the night. The Reign took their 4th straight win with a final score of Reign 7, Grizzlies 3. I flew Delta Flight 4111, departed Binghamton 430PM, arrived Detroit 605PM; I sat in seat 10D. I flew Delta Flight 2543, departed Detroit 715PM, arrived Los Angeles International at 941PM; I sat in seat 22A. I flew Delta Flight 2429, departed Los Angeles International at 140AM, arrived Memphis at 722AM; I sat in seat 24C. I flew Delta Flight 2314, departed Memphis 830AM, arrived Detroit at 1126AM; I sat in seat 12A. I flew Delta Flight 3914, departed Detroit at 155PM, arrived Binghamton at 315PM; I sat in seat 11D. Jill flew United Flight 6909, departed Binghamton 1013AM, arrived Dulles 1139AM; she sat in seat 8A. Jill flew United Flight 49, departed Dulles 1234PM, arrived Los Angeles International at 314PM; she sat in seat 33A. Jill flew United Flight 856, departed Los Angeles International at 1054AM, arrived Dulles at 640PM; she sat in seat 18B. Jill flew United Flight 6902, departed Dulles at 954PM, arrived Binghamton at 1124PM; she sat in seat 9A. We stayed in room #124 at the Hilton Garden Inn.